Don’t you think the Air Force has more pressing issues? This is micromanagement at its’ worst. I precisely needed to thank you so much again. I’m not certain the things I would have done without the type of creative concepts discussed by you directly on this industry. Certainly was a real hard dilemma for me personally, however , being able to see the very well-written approach you handled that forced me to leap over gladness. I will be thankful for this support and even have high hopes you find out what a great job your are carrying out educating the mediocre ones through the use of your webpage. Probably you have never met any of us. 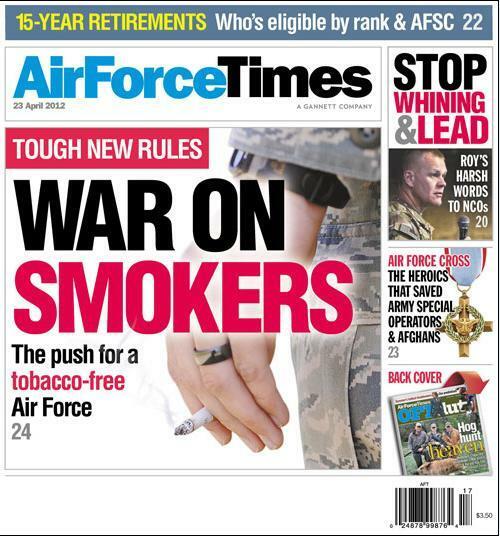 The Air Force has been trying to stop smoking for at least 20 years. When I first came in there stated goal was to eliminate smoking by 2010 and this was in or around 1990. They were unsuccessful in that. Now they are trying to eliminate something that is legal to do by making it as hard as possible to smoke the base. The top brass either does not have the balls or they do not have the ability to actually force people to not smoke, so they are trying to regulate it. This will not work, things like this have never worked and the generals at the top just want to present the appearance that they are actually doing something that they said they would do a long time ago.